Instead of getting a wake up call by the repeated word ‘Cambio’ from the money changers in the street below Friday 30th November provided a novel method a low flying helicopter. It was evident for the best part of an hour and I thought the sound might be with us all day. But before 08.00 it had gone out of sight. Perhaps being used to see how their tactics would work on the ground later in the day. When I eventually got out on to the street it was amazing how quiet it was. As I walked around I realised that transport – although drastically reduced – was functioning in a limited manner. But no one could have been sure of that and really only those that had to travel did so. Even the airport bus was coming into its normal bus station – although on a slightly different route. Why someone couldn’t have told me that when I went to ask is a route I won’t go down. However, that is merely academic now, although important for those arriving at the airport and unaware of the situation. But once the march starts later this afternoon I’m sure that all transport will keep as far away from the centre as possible, including into the late evening. I was also surprised to see that a few shops, kiosks, fast food outlets and even a couple of supermarkets had opened – and plan to be open all day. However, even those places that are open have the steel shutters ready to come down if all of a sudden there’s an angry crowd coming down their street. One of the supermarkets was even in the process of removing all alcohol from the shelves although another one just around the corner was happy to sell me some wine – I had gone in their for emergency rations as I don’t know how matters will develop later today. When it comes to the matter of alcohol I somewhat surprised that the police haven’t put a ban on the selling of any beer and the rest. Most places, basically restaurants, in the centre that sell alcohol are shut and will remain so for the next couple of days. So the only place to get a beer is from the supermarkets in the narrow side streets. As for the police presence it is overwhelming. There are supposed to be 20,000 police here ‘to maintain order’. 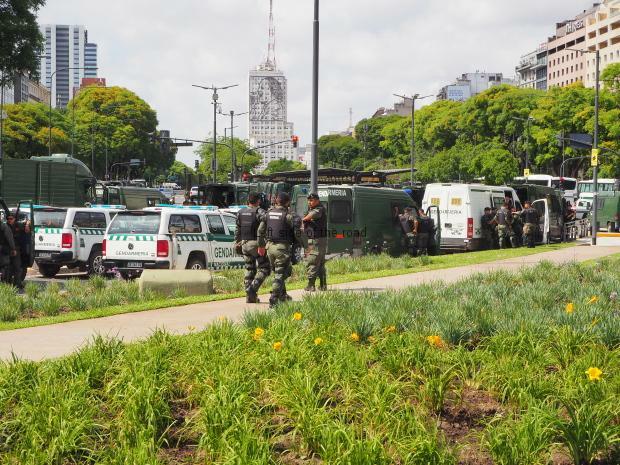 There is a huge congregation of buses, vans and cars of the Gendarmeria in the wide avenue, 9 de Julio, in the area net to the Obelisk. The authorities have restricted various access routes from the avenue so I’m not exactly sure what their plan might be when the march starts. Obviously their aim is containment but it’s impossible to see what it is when you can’t get an overall view of the situation. Small drones with a camera and someone with a map could probably get an idea of the police’s potential strategy. Apart from the concentration by the Obelisk the main presence of the police is a couple of them just walking back and forth along some of the small side roads. I presume they are there to be able to give warning of any build-up of protesters and to give early warning to their control. They are in too small a number to be effective alone. All the partially blocked streets are quiet at the moment, with no police presence at all. That will obviously change as the day wears on. What the marches will have to be wary of is any attempt at ‘kettling’. I can definitely see places where the march could actually do the police’s job for them, thinking they are getting through only to find an impassable wall. The temperatures are rising and being caught in such a situation would be worse than unpleasant. A police convoy passed by one junction where I was standing earlier and when it saw people sounded all their sirens. I don’t think there was any need for that – but these noises can be heard from a long way off so are another part of the psychological warfare that will be going on throughout the day. I went to the Casa Rosada and Plaza de Mayo this morning and there was no difference from what it had been yesterday afternoon. Extra protection is probably not really needed there as already the grounds have quite a substantial metal-fenced perimeter. Nothing is unbreakable but it would take some effort. It was also clear that there is very substantial extra fencing in the area of the Teatro Colon. To my understanding that will be the location of the end of summit Gala on Saturday night. Off for a rest now. It could be a long afternoon.